Lose yourself and find yourself at Bluestone, a holiday and short break retreat like no other. Stay in a luxury lodge in a woodland vale or in a cottage in a quaint Pembrokeshire village. Relax in gorgeously furnished space, or go out into the beautiful countryside and coastline around you, and have some fabulous adventures. We’ll arrange everything for you. Or for some really energetic fun, there’s our water park, The Blue Lagoon. 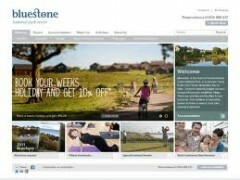 Situated within the Pembrokeshire Coast National Park, Bluestone has woodland walks, nature trails, picnic areas and cycle routes. A visit to Bluestone really is a chance to rejuvenate yourself, and re-charge your soul. The Brand eShopper365.com is a part of the global eShops365 LtD Impressum | Copyright © 2013.